Unparalleled Customer Service & Support From Our Independent Insurance Agency. Welcome to Cascade Summit Insurance. Representing The Top Insurance Companies in Oregon For Auto, Home, Business & More. Our independent insurance agency works with the top-rated auto insurance carriers in Oregon that provide you with the best rates and coverage you can have. Trust one of our team members to find you the right company for your situation. Cascade Summit Insurance can insure all of your property needs from homes, renters & condos! Give us a call and see why so many in Bend and West Linn trust us with their home insurance needs. We can even offer landlord insurance. Contractors and small business owners need a general liability insurance policy to protect them from lawsuit. It is a smart move to have a general liability insurance policy in place. With skyrocketing medical costs, it is important to protect your finances with a personal health insurance policy from Cascade Summit Insurance. We represent the best health insurance companies in Oregon and can find a policy that is right for you. Let one of our life insurance agents find you the right life insurance policy. To find out more about life insurance and what policy may be best for you, contact a licensed agent today at Cascade Summit Insurance at 503-636-4586 or request a quote online. 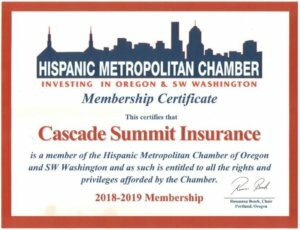 Why Choose Cascade Summit Insurance? With a combined 60 years of insurance experience and top-rated insurance company partnerships, we can find you the best insurance for your situation at the most competitive pricing. We live and work in your communities of West Linn & Bend, OR. Because we live where you do, we understand the unique risks and needs of Oregonian families. The beginnings of Cascade Summit Insurance can be traced all the way back to Lee Stidd Sr., who built his business in the 1920’s on the philosophy of “Insuring inSTIDD of Worrying”. After almost 100 years, three retirements, three moves and a name change, we still strive to provide our clients with protection and security through the many companies we represent. Over the decades we have received many awards for customer service from our companies and community service from the cities we live and work in. Overall customer satisfaction is our #1 priority. Serving you is our most important job! We look forward to continuing to serve and to earn our clients business each and every day. Please call (503) 636-4586 today and we will gladly assist you with your insurance needs.